1.1	This Regulation is adopted by the Commissioner pursuant to 18 Del.C. §§311 and 2712, 21 Del.C. §2118 and promulgated in accordance with the Delaware Administrative Procedures Act, Title 29 Del.C. Ch. 101. 1.2	21 Del.C. §2118 provides that policies purporting to meet the requirements of the Section must provide coverage and policyholder notifications required by that Section. 1.3	In order to enable insurers to satisfy this requirement, the following guidelines are promulgated to advise insurers of the standards which will be used by the Insurance Department in reviewing forms filed by insurers. 2.1.1	Bodily injury and property damage liability with limits of at least those prescribed by the Financial Responsibility Laws of Delaware. 2.1.3	Compensation for damage to property other than motor vehicles. 2.2.1	Compensation for damage to the insured motor vehicle, including loss of use of the motor vehicle. The provisions herein required need not be stated in the language or form of these regulations, but the coverage afforded shall be equal or of greater benefit to the insured with the exception of the requirement stated in section 11.1. "Bodily Injury" means bodily injury to a person and sickness, disease or death which results from it. "Funeral Expenses" means reasonable, customary and necessary expenses incurred within two years of the accident for professional funeral services. These expenses include the cost of a burial plot for one person. "Injured Person" is as defined in 21 Del.C. §2118(a)(5). "Innocent Third Parties" means claimants who at the time of the event leading to the claim (1) were not in violation of any Rules of the Road as promulgated under Title 21, Delaware Code and (2) whose activities did not contribute in any way to the accident. This presumption may be rebutted by clear and convincing evidence. "Loss of Earnings" means loss of salary or its equivalent, net of taxes which were lost by reason of inability to work. This covers loss of wages, salary or lost earnings of a self-employed person. Payment of lost earnings is to be at the time they are actually lost. “Loss of Use” means expenses necessarily and actually incurred by the named insured as a result of damage to the insured motor vehicle. "Medical Expenses" means reasonable charges for necessary medical, hospital, dental, surgical, x-ray, ambulance, professional nursing services and prosthetic devices. "Motor Vehicle" means a land motor vehicle, including a trailer or semi‑trailer as used therewith, required to be registered, licensed and required to carry insurance under the Financial Responsibility Laws. "Nonstandard" means an insured policyholder who is unable to procure insurance through the standard market and whose premium charge is in excess of the premium charged by the Delaware Automobile Insurance Plan ("DAIP") for similar (though not identical) coverage. "Substitute Service Expenses" means reasonable and necessary extra‑incurred expense for personal services which would have been performed by the injured person had he or she not been injured. "Wilmington Auto Accident Reparations Arbitration Committee or Its Successors" as described at 21 Del.C. §2118(g)(3) is deemed to include the insurance industry forums including the nationwide intercompany arbitration agreement, special arbitration agreement forum, automobile accident reparations arbitration agreement. The insurer shall undertake to pay on behalf of the insured all sums which the insured shall become legally obligated to pay as damages because of bodily injury or property damage caused by accident and arising out of ownership, maintenance or use of a motor vehicle. The policy shall designate by explicit description or by appropriate reference the motor vehicle to which this coverage applies. Indemnity from such legal liability shall be to a limit of at least the Financial Responsibility Laws of the State of Delaware and, if a single limit for such bodily injury and property damage liability is provided, such single limit shall be not less than the sum of the bodily injury and property damage limits stated in the Financial Responsibility Laws for any one accident. 6.1	The policy shall provide compensation to an injured person for medical expenses, funeral expenses, loss of earnings and for substitute services incurred as a result of bodily injury, caused by accident, involving the insured vehicle. 6.2	The policy must have minimum limits for this coverage as stated in 21 Del.C. §2118. The policy may provide for higher limits of compensation but the compensation for funeral expenses included in the foregoing shall not exceed the sum of $5000 per person. Personal injury protection benefits shall be payable within 30 days of the demand thereof by the claimants provided that reasonable proof of loss for which the benefits as demanded has been submitted to the PIP carrier. 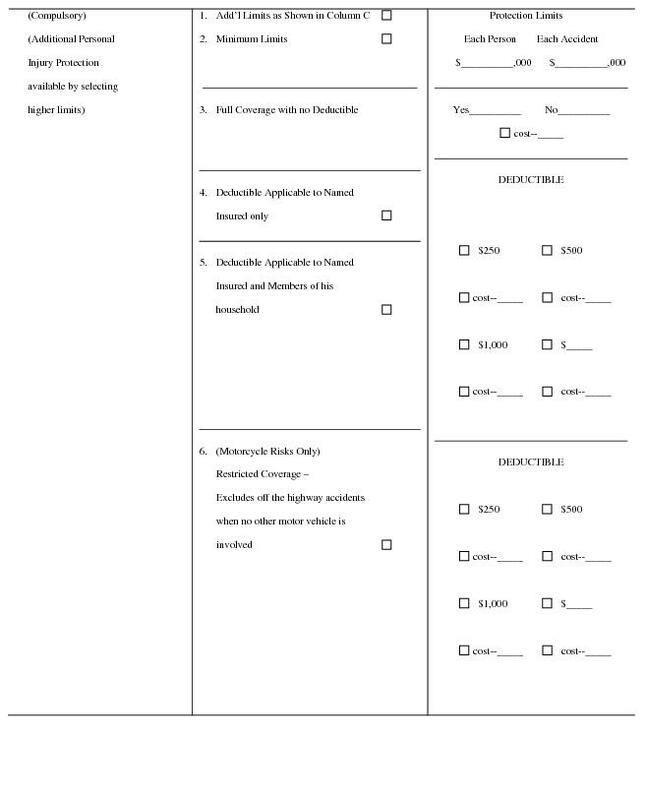 6.3	Any insurer, in accordance with filings made with the Insurance Department, may provide for certain deductibles, waiting periods, sublimits, percentage reductions, excess provisions or similar reductions at the election of the owner of a motor vehicle to apply only to loss and expense incurred as a result of injury to the owner of the vehicle or members of his household. All deductibles offered must be per accident and not per person. For the purpose of this coverage members of the owner's household shall be members of the named insured's immediate family not having a separate household, and persons actually residing with and economically dependent upon him/her. The owner's election of any reduced benefits described in this section must be made in writing and signed by that owner. The requirement of an election in writing may be satisfied by a statement on the application for insurance, or other form which shall clearly convey the effect of his/her option selected. In order to assure that this election is made, insurers, agents or brokers must offer for the consideration of the owner the deductibles or similar reductions required to be filed in accordance with this section. 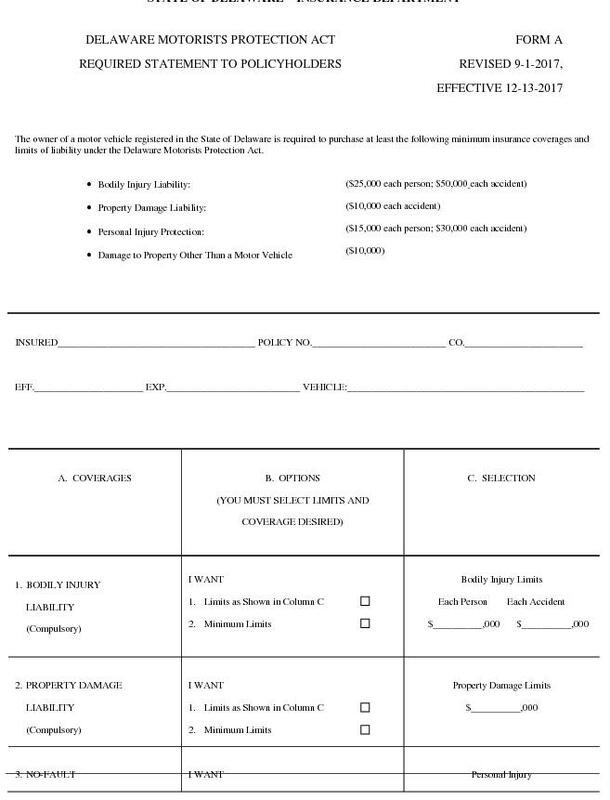 Compensation for damage to property arising as a result of an accident involving the motor vehicle, other than damage to a motor vehicle, aircraft, watercraft, self-propelled mobile equipment and any property in or upon any of the aforementioned, with the minimum limits of $10,000 for any one accident. Payments under this section shall be excess over other valid and collectible insurance. 8.1	Every insurer shall offer compensation for damage to the insured motor vehicle identified in the policy including the loss of use of the motor vehicle up to but not exceeding the actual cash value of the vehicle at the time of the loss. The coverage for loss of use shall not be less than $10 per day. 8.2	The owner of the motor vehicle so covered may elect to have such coverage excluded in whole or in part by use of certain deductibles and exclusions in accordance with filings made by the insurer with the Commissioner. 9.1	The coverages provided in an insurance policy as described herein may be subject to conditions and exclusions customary to the field of liability, casualty and property insurance and not inconsistent with the requirements of this section. 9.2	Personal Injury Protection benefits shall be considered excess to any other similar insurance for passengers, other than Delaware residents, when the accident occurs outside this State. 9.3	To enable owners of motor vehicles to properly exercise the coverage elections, insurers are required to offer deductibles, waiting periods, sublimits, percentage reductions and excess provisions as designated in 21 Del.C. §2118(a)(2)(f). 9.4.2	to inform the policyholders of the availability of the Delaware Assigned Insurance Risk Plan ("DAIP"). Notwithstanding the above, no agent is required to write a DAIP policy. 9.5	Insurers are required to notify injured persons covered under this section that the coverage is for two years from the date of the accident, and that it only extends beyond two years in cases involving surgical or dental procedures related to the accident and that were impossible or impractical to perform within the two year period. Such surgical or dental procedures must be verified in writing within two years of the accident, by a qualified medical or dental practitioner. The insurer must give prompt and timely notice after the written application for benefits has been made. This notice can be included on the APPLICATION FOR BENEFITS form. 10.1	All insurers authorized to write auto insurance in this State shall be deemed signatory companies of the insurance industry forums arbitration agreements for accidents, insured events, or losses occurring within the limits of the State of Delaware regarding first and third party claims and to first party claims in other states or territories of the United States or foreign countries. 10.2	The requirement to participate in intercompany arbitration for Delaware disputed claims shall not imply that non‑signatory companies are obligated to become "signatory companies" to the intercompany arbitration agreements or to affect these companies' position with respect to intercompany arbitration outside the jurisdiction of this State. 10.3	Non‑signatory companies shall be subject to all duties and obligations of signatory companies with respect to Delaware claims, or the claims of Delaware policyholders. This includes payment of dues and fees and compliance with the various arbitration forum rules. 10.4	In all disputed Delaware claims involving damage to vehicular or non‑vehicular property of "innocent third parties", where the dispute involves a liability determination, the insurer providing liability and/or non‑vehicular no‑fault property damage coverage for the vehicle which actually strikes or first strikes the "innocent third party's" property shall promptly pay the "innocent third party's" property damage claim. The total payment shall not exceed the lowest of the applicable available coverage of the involved insurance carriers. The insurers shall submit the case to the appropriate arbitration forum after diligent efforts to resolve the claims of the contesting insurers fail. 11.0	Delaware Form A "Coverage Election"
11.1	The coverage election form (Delaware Form A), attachment to Regulation 603 (Formerly Regulation No. 9), shall be properly presented by the insurer, broker, or agent to the policyholder, and acknowledged by the policyholder's signature. Proper presentation by the insurer, where possible, should be in person at the time application is made. If personal presentation is not possible, or if there is further need for clarification, insurers may present Form A by mail. The language or context of Form A shall be as shown unless, in accordance with filings made with this office, the insurer offers options, deductibles, etc., other than those described on the approved form. Any amended Form A shall clearly describe all additional options of coverage and must be filed with this Department prior to use. Any version of the coverage election form which deviates from Delaware Form A must be filed with the Department prior to its use except that companies may overprint the form with company name, address and logo without filing it with the Department, providing the text remains unchanged. 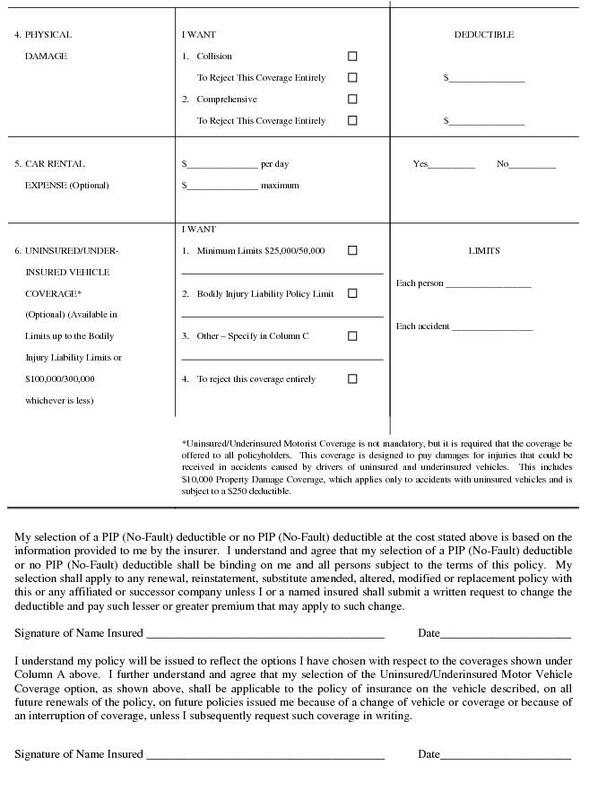 11.2	The policyholder shall receive a full explanation of all deductible options available to the policyholder in writing as a separate document from the insurer and the insurer shall obtain from the policyholder a written acknowledgment of the policyholder’s receipt of such explanation as a separately includable item on the Form A. Additionally, the Form A acknowledgment signed by the policyholder shall include the related cost for each deductible offered by the insurer. 12.1	Insurers not less than once annually shall inform their policyholders of the coverage in force for each auto policy. The form of this notice may be in any form reasonably calculated to inform policyholders of their existing coverage. My agent has informed me that I am considered a nonstandard driver and has notified me of the availability of the Delaware Automobile ("Assigned Risk") Insurance Plan, which provides less expensive automobile insurance for some drivers." 12.3	The failure of a policyholder to sign and return this statement shall not create any legal rights nor shall the insurer be responsible for the policyholder's failure to return the signed statement. An injured party shall submit to reasonable treatment recommended by competent physicians, and must act reasonably to minimize the disability and mitigate damages. If any provision of this Regulation shall be held invalid, the remainder of the Regulation shall not be affected thereby. This regulation became effective December 1, 1983, was amended May 16, 1987, and was further amended effective December 13, 2017. The effective date of the third amendment, including revisions to Form A, is December 13, 2017. The use of revised Form A shall be required for all newly written and renewed policies issued on or after December 13, 2017.